Also in 2007, Elaine Ostrander at the National Human Genome Research Institute surveyed genetic variants in a small region of chromosome 15 in Portuguese water dogs. They found that smaller water dogs tended to carry one particular variant of the gene for Insulin-like growth factor 1 (IGF1), an important growth regulator. Now in its third year of operation, Acme Canine was establishing itself as a canine training center. Throughout 2007 the staff developed articles and handouts to assist client with building a better relationship with their dogs. 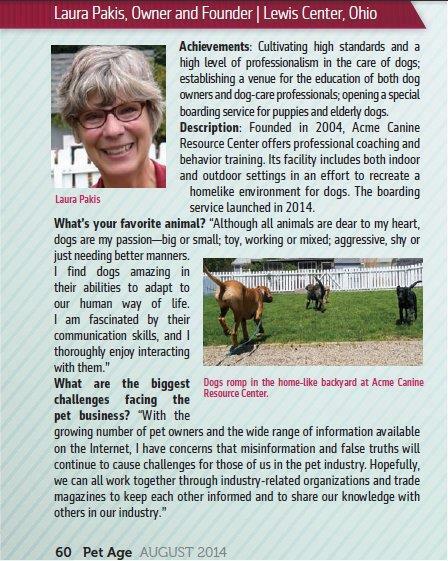 To follow its mission, Acme Canine created several dog-related events to encourage obedience as a way of life. They held a Doggie Egg Hunt, a Pool Party for dogs that liked water (and to assist those that were afraid), a birthday party for demo dog, Woofie and a Halloween party for dogs which included dog games and raffle prizes for their owners. The number of clients during 2007 doubled from 2006. Due to the growth Laura Pakis made the decision to add on to the house at 1385 Franklin Street and create a 1,200 square foot training center. This entry was posted in The History of Acme Canine and tagged 2007, Acme Canine, dog events in 2007, training facility. Bookmark the permalink.